August was temperature-extraordinary and standard as to the precipitation compared to long-term average. The windstorm on 17th August caused the fall of about 40 hop gardens in Saaz and Auscha area (6ha of it at our farm). In the first half of August the chemical protection against Peronospora and sporadically against Red Spider Mite was executed. During the second half of the harvest hop was partially harmed by Peronospora in some localities. Hop Aphids nearly do not affect. Majority of growers started the harvest from 19th to 21st August. Harvest acreage of the whole Czech republic is 5307 hectars (new planting 257 hectars from that). Harvest termination is expected from 4th to 8th September. 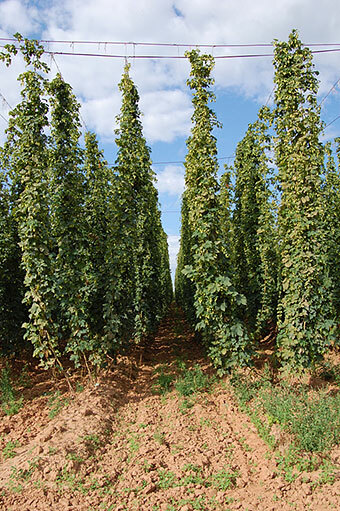 Saaz hops average yield in the whole Saaz area is estimated to be at the level of the last year. Attached photo show the typical stand of non-picked hop garden on 2nd September, 2009.